Ella and I took a quick trip down to Eugene to visit Uncle Joe and Aunt Zee (Lindsay), and also to give Michelle some uninterrupted work time at home. We rolled in to town around 2:30pm after a quick stop at the rest area right outside town for a potty break (Ella’s 95% done with potty training!). 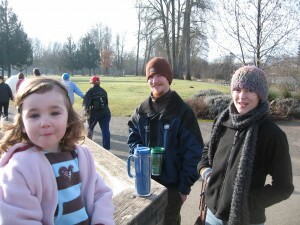 We stopped by the park to stretch the legs, then went to Skinner Butte to watch rock climbers. Ella was so enamored that we spent nearly an hour there with her climbing the smaller columns to the north end of the wall. She would climb up with some guidance on foot placement, then scold me for getting too close. Dad’s get to do stuff like that. Ella really wanted to actually try the main routes but I told her that she’d have to wait her turn. When there were actually unused ropes, I had a hard time talking her out of climbing. Instead, we went by the train yard to see Joe at Oakshire Brewery before heading home with him for dinner. After dinner we played with duplos for a while then hung out, reminisced and complained about getting old over a few home brews and a bottle of Deschutes’s Abyss. Yum. The next day we grabbed bagels and went to Alton Baker park and wandered around for a while before we had to get Lindsay back to her doctoral program grind. Ella chased seagulls around the park, then chased cats when we got back to Joe & Lindsay’s until we had to get underway. 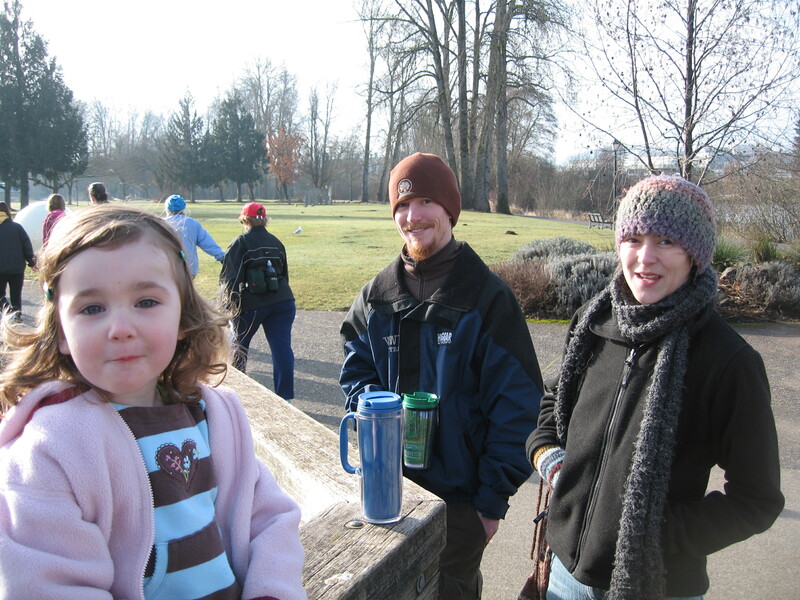 On our way out of town, we tried to catch up with Travis and learned that Beth and Mirabess were also in town. (All our friends are moving away from Portland) Ella and Mirabess played with soft dough and ate some pizza while us adults caught up. A nice surprise before the surprisingly quiet and uneventful trip back to Portland. Michelle and Madeline are back to work today after nearly 5 weeks off. We can’t believe that it’s actually been 5 weeks already. We haven’t established anything resembling a routine like we’d hoped. I suppose it would have been temporary anyway, but with the illnesses and such, we didn’t do a very good job of relaxing. We did however manage to paint two rooms, build most of a dresse, kill some rats and enjoy ourselves some. I’ll be going back after the first of the month so we’re trying to relish in the time with family while we can. Michelle’s workplace is really cool about bringing the kids in, and at least with Madeline, the interruptions will be minimal. It was a little weird explaining to Ella why Madeline had to go to work. Luckily we have dance class today which is even more exciting than work. When we first got the chickens last spring, I read Storey’s guide to chickens from cover to cover. One of the many things it covered was the issue of rodents. The coexistence of rodents and chickens is almost unavoidable because the chickens are rather messy and clumsy eaters and the design of most coops allows the small, conniving rodents access to pick up the scraps. Though nearly unavoidable, you want to reduce opportunities for rodents to the best of your abilities. Last fall, our rodent story begain with a family of mice that set up shop in the garage to take advantage of the loosely guarded scratch (dried corn). At first, I was gentle. I caught 9 mice in 24 hours and released them all a block away at the abandoned building and blackberry thicket. But then I had to start using kill traps when the little buggers failed to take the hint. After a week or so, we’d cleaned up. No food source, no mice. Then, about a week ago I looked outside and saw a rat. Not a tiny, cute field mouse, but a big ‘ol Norwegian. I wasn’t surprised (we live in the city after all) and the hens have a steady diet of chicken feed, scratch and kitchen scraps. I wasn’t immediately sure of what to do since we couldn’t exactly get rid of the food source (lazy, sloppy chickens), but resolve wasn’t formed until I noticed the rat had burrowed in to the compost bin and had pulled out bits of celery stalk, carrot, apple core and potato. I’d be happy to have vermicomposting , but that’s done with worms and flies, not rats. And I now know why: Rats take stuff out of the compost bin. And their tiny little feet leave prints in the snow. So, we decided to trap. It didn’t take long for us to catch the rat, but then evidence has come in that maybe it wasn’t a solo gig. The biggest surprise of all? I was walking from the garage to the house when my foot sank. The brick I had stepped on sunk about 4 inches under my foot. Panic set in because the neighbor across the street was dealing with a drain-related sink hole. Over the next few trips between the house and the garage, another several bricks sunk underfoot. Crap. Wondering what to do if we had a sink hole, I remembered the house we rented in SW Portland with burrowing rats who dug from the crumbling crawl space out to the middle of the yard under the bird feeder to get bird seed from underneath. So I pulled up a few bricks and discovered tunnels. 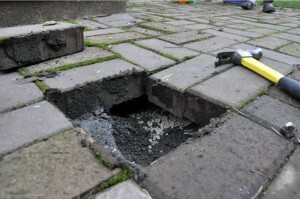 The rats had created a maze of tunnels under the brick patio. Tunnels filled with chicken food and bits of compost. Impressed and annoyed, things have been escalated. I worked on cramming the tunnels full of dirt and fixing bricks. I ended up placing about 7 gallons of dirt back into the ground before sanding the bricks and resetting the traps. This is likely to be a protracted battle, and I suspect that I’ll lose.